Built on the banks of the Thames at the west end of the City of London, this is one of three stone keeps established after the Norman conquest to secure London. The building in this drawing is a 15th-century reconstruction of the castle. 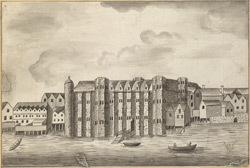 The drawing shows the riverfront side, and the five projecting towers (added in the early 16th century by Henry VII) between the two older polygonal towers. This is a copy of an older drawing, made before the Great Fire, in which most of the castle was destroyed.